In dry skillet over medium-high heat, toast peppercorns, fennel seed, and mustard seed until fragrant, about 3 to 4 minutes. Allow spices to cool, then grind in spice mill. Combine ground spices and remaining ingredients. Refrigerate until ready to serve. In large bowl, combine shaved cabbage and onion. Set aside. Combine sugar, vinegar, water, salt, and pepper in saucepan and bring to boil over medium heat. Cook, stirring occasionally, until sugar and salt dissolve. Pour hot liquid mixture over cabbage. Let cool for a few hours before using. Combine Parmesan, bread crumbs, cornmeal, parsley, paprika, cumin, garlic, salt, and pepper on plate. Place flour on a separate plate. Place beaten eggs on third plate. In deep fryer, heat oil to 350°F. Dredge fillets in flour, then egg wash, and finally cornmeal breading. Fry fillets until golden brown; when finished cooking, they should float. Remove to paper towel-lined plate. Butter each side of halved rolls and broil, butter side up, until golden brown and toasted. Spread Cajun mayo on each roll to taste. 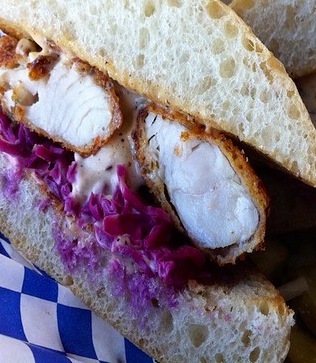 Add pickled red cabbage using slotted spoon, then add walleye fillet.